Late last week a dear friend who is more familiar with C scales than sea life visited from the San Francisco area. 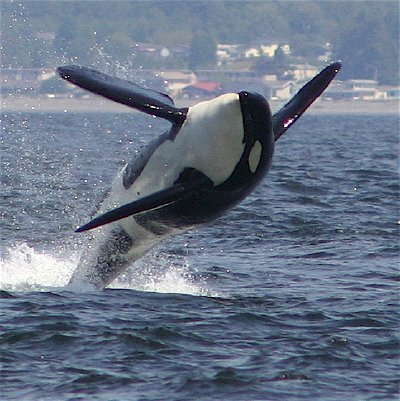 The weather here could not have been more beautiful, and her arrival was the perfect reason to book a whale-watching tour. 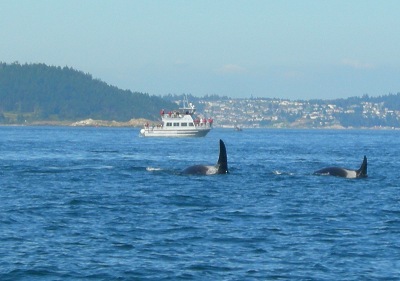 Even in these famously cetacean-filled waters of the northwest, there’s never any guarantee that large mammals other than over-fed tourists will be on display, yet on a gorgeous afternoon, the boat ride alone is always worth the ticket. 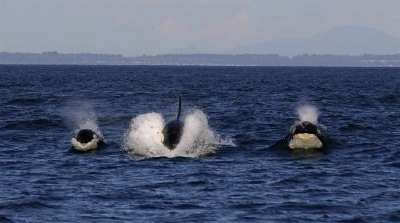 And you thought whales only did this for union scale and some fish from a smelly bucket at Sea World. As I type this at 2:15 a.m. early Tuesday, another natural, black and white phenomenon is occurring directly in front of my eyes: a total lunar eclipse. How is it that this event– not that uncommon– is always so fascinating? To my delight, the moon has risen right in front of my desk window. Wth one eye on th kyboard andd the othr to teh skyy, I’m marveling as a larger and larger bite gets taken out of this formerly electric full moon, causing the surrounding woods to dim dramatically. 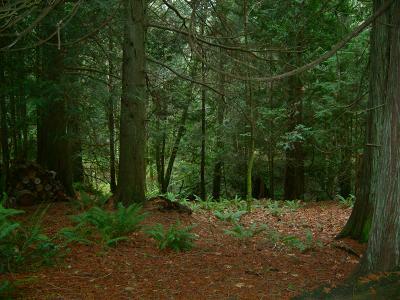 Opening my door and stepping into the forest that shrouds my studio, I realize that it’s the first time I’ve been in such a relatively isolated natural environment while experiencing this sight. It deeply struck me just how frightening these inexplicable skyward events were to our ancestors, whose lives were tethered to the rise and fall of the sun and moon. Watching an unidentifiable mass of dark grey begin to swallow up the rock above your head on which you’ve always depended must have been very scary. Watching it consume that orb and then turn it copper red must have been nearly terrifying. Oh, the relief they must have felt in an hour or so, as the world they knew was returned to them. I attempted to take a good photo of tonight’s special moon to post, but since I can barely capture something as huge as a whale in broad daylight, you can only imagine how pathetic my lunar pix turned out to be. I think I’ll buy myself a tripod someday. Holding my breath as I strain to keep the open shutter totally still just doesn’t seem to do the trick. I haven’t composed any research vessel music yet, so try this. The past couple of weeks, I think I’ve spent more time on water than on solid ground. Between sailing with friends on open water and lakes, ferry rides between various islands in the U.S. and Canada, and kayaking, I could not be a whole lot happier than I am, living in a place where a connection with the water is essential. 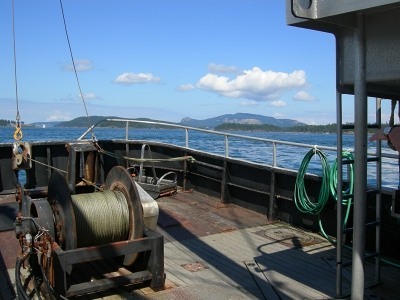 Of all the floating around I’ve been doing in between ongoing professional note alignment duties and ongoing amateur home improvement projects (this triumvirate of constant busy-ness is my excuse for not blogging this past week), so far my biggest aquatic thrill occurred last Friday, when I was invited to go along on a scientific outing on Friday Harbor Labs’ research vessel Centennial. I’ve mentioned it before on these pages and it’s worth repeating: most readers of this little bloglet know I’m a wannabe marine biologist at heart. 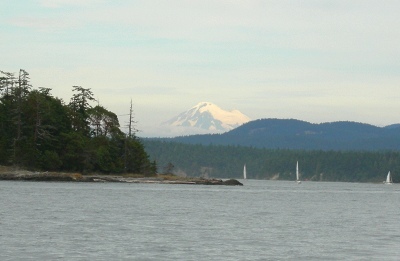 But when I chose to make the San Juan Islands my new home, I actually had no idea that one of the world’s leading marine science research facilities was right here in Friday Harbor, just two miles from my house. Proof that the universe does some pretty cool things, it turned out that one of the most welcoming neighbors diagonally across the street from our new address sits on the Lab board, and immediately invited me to participate in its activities. In short order I’ve had the chance to visit the campus several times, meet some of the terrific people at the core of its programs, and most recently, spend an afternoon getting my hands wonderfully muck-filled with professional scientists as we examined various sea creatures dredged up from the ocean floor. I sent a thank you card to the guys who organized the trip in the form of a few photos from the outing, and although some of the comments are only relevant to the people there that day, I share it with you here if you’re curious to see what makes a geeky, salt-water drenched composer very, very happy. Island music for the island sailors. I’m back from today’s Shaw Island Classic sailboat race… uh, glide…. um, drift….. float… I mean…. well, what I mean, is that very few boats actually made it to the halfway mark, much less all the way around Shaw Island. There was a paucity of wind, and an abundance of strong current running in the opposite direction of where the boats actually needed to go (in this case, all the way around Shaw). Conditions were challenging, in a slow-motion kind of way. The couple on whose boat Charles and I crewed agreed when I declared that the race committee should judge us in a manner similar to that of ice skating, where you get extra points for snazzy tricks like spins and pirouettes. Because that’s exactly what our talented 35′ boat did at least twice, when caught without steerage (no wind means the wheel has nothing to control) and in the grip of strong, swirling currents that had us dangerously close to the rocky shoreline for a few wide-eyed minutes. Other extra points should be awarded for elegance of maneuvers with new dance partners: two or three times, our feet would have made Fred Astaire proud, as our legs reached out to fend off other drifting boats in the race to avoid mutual damage to shiny paint jobs and egos. We would have won our biggest points during a memorable minute when, just yards from the rocks on the southeast end of Crane Island and caught in the doldrums with a powerful whirlpool of a current, our boat drifted up against a mooring ball tethered to a cute little 17′ sailboat. As we squatted at the edge of our hull and tap danced our way across the ball and boat, along came another hapless and even larger sailboat in the, uh, “race,” who drifted up against the other side of the same small ball and boat, which was also the side that was about to push them right onto the rocks. To the sporting sounds of hoots, cheers, and amused comments from a few onlookers who did not own boats and stood comfortably on dry land with drinks in hand, our two crews provided the entertainment for the day as many nimble sets of concerned feet gingerly pushed outward in all directions as the two sailboats simultaneously met with each other, the mooring ball, and the little daysailer, creating a sandwich filling from the latter. Amazingly, no boats ever touched, although the round of boat-to-boat footsie was worthy of a Twister party game, and about as ridiculous looking as one. More points from the judges, please. I am usually a stop-and-smell-the-kelp kind of sailor, and this was my very first race. In addition to having a great time out on the water despite having to throw in the towel and use our engine to finally make it around Shaw and return home, it was quite an object lesson in physics. To wit: the most important ingredients in sailing are not only wind and current, but long limbs and a sense of humor. …and the less tired your legs are! 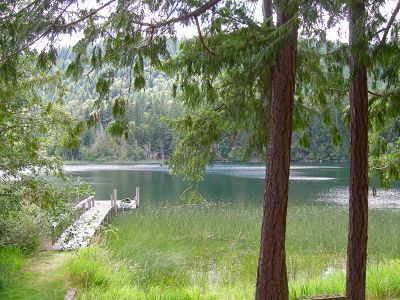 We spent the past couple of days with friends who live on St. Mary lake, Salt Spring Island’s largest. This magical spot in British Columbia became the central meeting point for four sets of formerly and presently California couples, each comprised of one usually stable non-musician happily coexisting with one sometimes crazed musician, and all with strong ties to this archipelago: the newly relocated Charles and me from San Juan Island ten miles to the south, another who moved from the Bay area to Salt Spring Island last year, another who were on their way up from Los Angeles to their other home on Quadra Island 150 miles to the north, and our hosts, who have split their time between Los Angeles and Salt Spring for many years. This photo of the home’s dock floating among the reeds and the lily pads says it all. Although, I suppose it omits the part about the great food and wines, the beautiful time spent sailing and canoeing along the breeze-driven water, the hike above the lake with rewards of multinational vistas (I swear I could see Japan in the far distance) and the stunning blanket of stars and meteors above our heads as we all laid on our backs on the dock on a warm evening. I stared up into infinity, counting satellites and blessings. 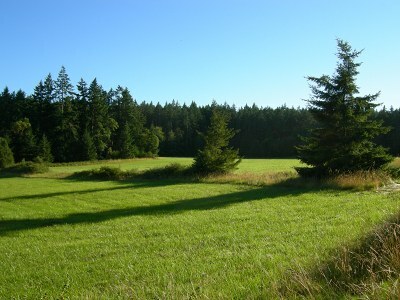 The extending shadows across this soft field by my house tell the tale of summer: we’re teased by three beautiful months, tempting us away from the things we think we should be doing (usually inside, at a piano or a desk. Or, under them, if things aren’t going as well as hoped). Long fingers summon us, yes– pull us– away and gleefully reorganize our priorities, blind to pressing deadlines and delivery dates. Thank goodness for this sultry reminder each year to just… be. The deer need no reminding, it seems. They are invisible in this photo. That’s because they were late for dinner today. But every evening around this time– oh, 7:30 or so– almost twenty of our hooved, sweet-faced neighbors spread out fairly evenly across this expanse for the all-you-can-eat buffet of fresh grass and flowers. Yesterday, driving home after a beautiful day sailing with friends toward the Canadian border (yes, and back, despite the current federal wire-tapping fiasco), I laughed at the sight of a gaggle of geese squatting squarely in the middle of the herd. A bald eagle glided low overhead, and staring at this bestial trio I instantly knew that there were more important things for me to experience at that moment than whatever awaited at my studio. Tomorrow and its insistent deadlines will arrive, no matter what. But these flashes of life have to be absorbed when they’re fresh on the hoof, on the webbed feet and on the wing. In turn, the muses reward with ideas that spring from a calm and open mind. A calming Vista for this vista. Yes, I think the title of this post would be the ad in the classifieds. 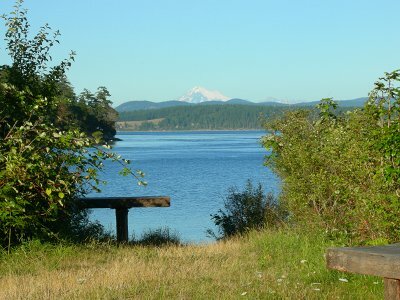 Two well placed benches gaze across the San Juan Channel, over Lopez Island, and out to the Cascade mountain range. Flanked by unruly and tempting brambles of blackberries, they face Mt. Baker, a let’s-hope-it-stays-this-way inactive volcano and ski area. This serene spot is right down the road from the place I bang bang hammer dust dust call bang wipe dust home now wipe dust wipe dust wipe more dust give up. When chaos exists bang bang hammer oops inside your domicile, even in the name of making it more slam whack bang bang wonderful than it may already be, a soothing place like bang crash oops whack this is a real gift.